The Milk Code has been in existence since 1986. Admittedly, it is not an easy law to read and understand. Further, despite being in force for almost 20 years, violations are still quite rampant. I previously posted about how marketing of feeding bottles and teats can be considered a violation. For this post, I will focus on samples and giveaways - how they violate the Milk Code. Let me again emphasize - the law EXISTS. What I am attempting to do is provide examples of violations to make the law understandable and more palatable to the general public. Thank you Marisse Gasmen for this photo! Section 6(b). Manufacturers and distributors shall not be permitted to give directly or indirectly, samples and supplies of products within the scope of this Code or gifts of any sort to any member of the general public, including members of their families, to hospitals and other health institutions, as well as to personnel within the health care system, save as otherwise provided in this Code. Section 21. Gifts of any sort from milk companies/manufacturers, distributors, and representatives of products within the scope of this Code, with or without company name or logo or product or brand name shall not be given to any member of the general public, to hospitals and other health facilities, including their personnel and members of their families. What is being given away? 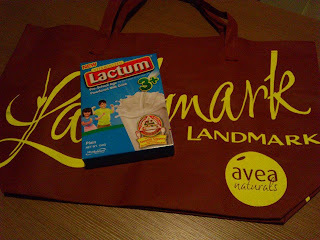 It is a pack of Lactum milk. Who is doing the giveaway? Mead Johnson - a company who manufactures products within the scope of the Milk Code. Why is it a violation? The giveaway - a pack of Lactum milk which is growing up milk. Milk companies will argue that it is not covered by the Milk Code. However, breastfeeding advocates will argue that it is still covered by the Milk Code because some moms breastfeed their babies even at 3, 4, 5 years old. Hence, the growing up milk is marketed to replace extended nursing. Further, the samples of growing up milk fall under "gifts of any sort" which are given to a "member of the general public," which is clearly prohibited under the Milk Code. Clearly a violation - but still being done by milk companies. Why? Because the penalties are ridiculously low! Sec. 13(a) Any person who violates the provisions of this Code or the rules and regulations issued pursuant to this Code shall, upon conviction, be punished by a penalty of two (2) months to one (1) year imprisonment or a fine of not less than One Thousand Pesos (P1,000.00) nor more than Thirty Thousand Pesos (P30,000.00) or both. Should the offense be committed by a juridical person, the chairman of the Board of Directors, the president, general manager, or the partners and/or the persons directly responsible therefor, shall be penalized. The penalty - even at the maximum of P30,000.00 - is just pocket change to these milk companies. Further, nobody has been imprisoned for the violation of the Milk Code. Sec. 13(b) Any license, permit or authority issued by any government agency to any health worker, distributor, manufacturer, or marketing firm or personnel for the practice of their profession or occupation, or for the pursuit of their business, may, upon recommendation of the Ministry of Health, be suspended or revoked in the event of repeated violations of this Code, or of the rules and regulations issued pursuant to this Code. We can go after the licenses/permits to operate of these milk companies. There must be repeated vioaltions through so as concerned citizens, what can we do? Each time we see a violation, document it by taking pictures or videos then submit a report to www.milkcodephilippines.org. Mom Pop Up at the Fort!